How to prevent ourselves from Basic Level Hacking ? Answer of the question is very easy and known to us but sometime we won't cares a much which led us get hacked by someone. Basic level hacking can be done by anyone, even recovering someones account and take the ownership is also a kind of hacking. We just needs to take care of few things to get prevented from someones hacking and no matter how the great the friendship or brotherhood is if like to play ourselves safe then better don't let others to use the phone or laptop and even if you have to then keep the safety measures on all the time available in your phone or laptop. * Avoid Pattern-Lock in your Smart phone, always use password in your phone with a combination of Upper Case, Lower Case, Special Characters, Numerical. Infact if your password is say "Abc@123" then also it is more safer then any pattern lock. * For Laptop / Computer users if for example in your family some other people use the same laptop / computer, then don't share your User password with them, better enable Guests user or ask them to create their own User ID in the computer / laptop. Being a Admin of the local computer you can always restrict user by creating certain group policy which will help you to save from further hacking. - Same thing applies with high end mobile as well like Nexus phone who used to provide multiple accounts feature on the phone hence better not to disclose your personal user password and keep the Guest type user for other users access. * Enable 2 Step Verification for Gmail and other Mail Clients if they providing. With this feature other users will not able to login in your mail account so easily. - Currently 2 Step Verification is possible by 4 ways, 1. Through Registered Mobile Number, 2. Through Backup Email ID, 3. Through Authenticator App and 4. Backup Codes. 2 Step Verification Code requires if you're using your personal mail in public computer and not in a trusted device. During logon make sure you won't check in public computer as a trusted device and do logout from your account after work. You can also revoke access of a device through My Account settings. If you're using Mobile Number then make sure it remain in working condition because unless you won't receive code from Google via SMS or Call you won't be able to enter in your account or recover it. You can use another Email ID to recover your account or used to login but make sure that Email ID is safe and should be protected because if its hackable then your primary email id too can be hack. In 2 Step Verification you can login in your account via Authenticator App or via Backup Codes but try to keep things safe. * Avoid using Third Party App Store. Make sure you downloading or updating apps through Google Play Store only. It also applies with any Apps you're using for example if you're using Twitter then use Official Twitter App only and not other third party app which can easily compromise your account. * Always try to find out the services you connected with your account and the device you login with if any of both get hacked then your account info will be compromised. Also double check the permissions you have set as always either its of Apps in your smartphone or your account say a Mail Account or Social Account and Revoke or Grand access accordingly. * Never load wallet with full capacity. Like many wallets provides you the capacity of Rs. 10,000 or Rs. 20,000 but that doesn't mean you needs to load the amount with its full capacity, put a minimal value which won't hurt even if something goes wrong. * Keep both your Email and Mobile Number up to date in a Wallet Accounts, Mail Accounts & Social Accounts for recovering it. * Never use any third party anti virus in your phone. OEMs or OS developers provides the latest security patches which helps your phone prevented with latest threats. * Never download any third party App locker, few OEMs provide inbuilt App locker which helps you to keep your data save. Even few chatting apps like Hike, Telegram provide locking system by their own hence try to use the built in security feature. * For Laptop / Computer users do not use Freeware Antivirus, this will harm your computer more then without Antivirus, genuine OS users always gets a protection from the developer end like Windows Defender in Windows OS. * For Laptop / Computer users if you're using Advance OS then better keep the data protected with Bit Locker which will not only encrypt your Data but also won't allow access to your Local Drive consist of Personal Files and Folders, without password database will not be accessible and you will be protected from Unauthorised access from anyone. - Similarly Mobile users too can encrypt entire Mobile data which will prevent database from hacking unless someone don't know the password database can't be decrypt. * Never use someone's phone or computer to access your personal accounts like Mails or E Wallets etc. Even if you did then try to login with your trusted device immediately and revoke access of Mail accounts of the device and quickly change the password of other accounts if you have a possible threat to get hacked. * If you're using Public Wifi then better block all unknown connection via Firewall, if you don't know that stuff then better keep the distance from Public Hotspots as well. * Keep the Mobile Device and Laptop / Computer up to date with latest Operating System, Software and Security patches. * Never Root your primary phone, rooting will not only void your warranty but also make the phone vulnerable, you can have a access of many untrusted apps as well which are harmful but will never tell you the insight behind it since the phone is opened to play, hence for experiment purpose you can use your old phone rather then selling it or buy a entry level phone but never use a Rooted phone for primary business. 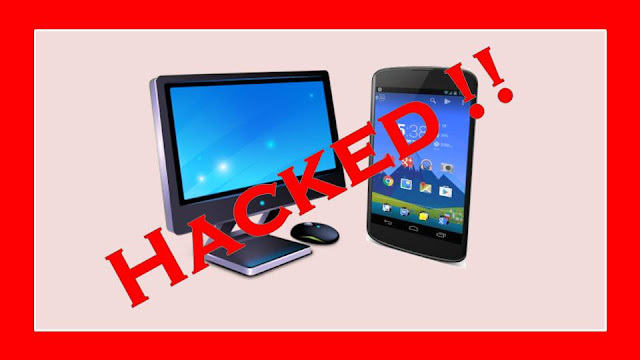 These are few simple tips which can help us to get hacked from basic level hacking. We always avoid these stuffs or won't take things seriously which may cause us by loosing up big. Disclaimer: The following post is meant for awareness purpose only and not to encourage any level or kind of hacking in real.